The Golf Course at Adare Manor underwent its first winter maintenance programme to ensure the finest playing conditions for 2019. 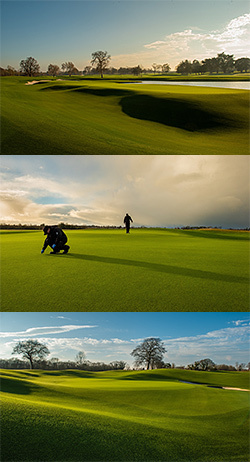 Limerick, Ireland (Wednesday, 13th March): County Limerick’s 5-star Adare Manor has reopened its fairways to golfers for the season after an extensive and thorough maintenance program to ensure the course continues to play in first-class condition to members, guests and hotel residents throughout the season. Approaching its 1st Birthday since the redesign was completed last April, the greens team at Adare Manor has left no stone unturned in the first round of maintenance. The putting surfaces have been shown special attention. Carefully scrutinised to identify and handpick any Poa Annua has helped achieve the desired pureness of putting surfaces. Whilst to further ensure greens are in pristine condition, the staff having been plugging, by hand, old pitch marks and imperfections to then replace them with plugs from the turf nursery. These careful processes and attention to detail means the Pure Distinction Bentgrass Greens at Adare Manor will give the truest putting surfaces throughout the season. The Greenkeeping team have also been carefully adjusting the sand depths of the 42 bunkers to achieve the desired level of 3 inches on the faces and 4 inches on the bases, that will produce consistent and uniform lies in bunkers across the golf course. The Golf Course at Adare Manor is looking better than ever going into this golfing season. Click here for a video and an insight into the maintenance programme at Adare Manor.